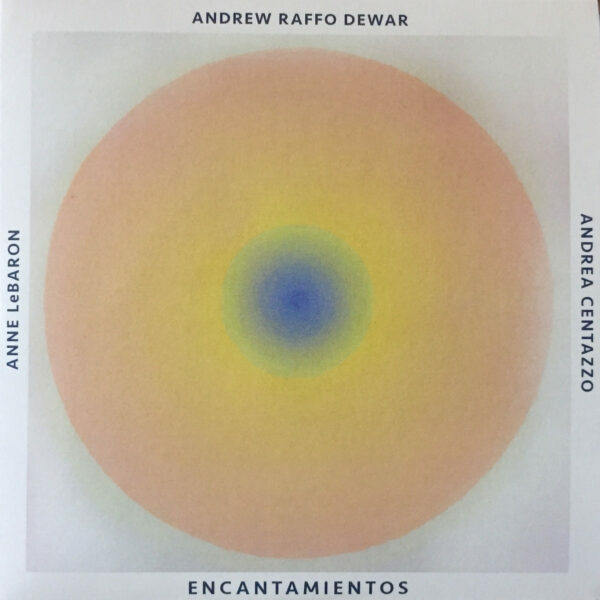 Very good trio improvisations on Encantamientos (PFMENTUM CD104). The team of Andrew Raffo Dewar, Andrea Centazzo and Anne LeBaron are substantial players, seasoned veterans, and all have their well-defined styles of playing with which they are fully conversant, which accounts for the confident manner in which they deliver these seven pieces. And yet along with the confidence, there is still this strong sense of exploration, of investigating things that are not known; mystery and enchantment continue to hang over the performances, and the listener can’t help but be intrigued. Besides this somewhat mystical dimension, Encantamientos works beautifully as a combination of exciting sounds: soprano saxophone, electric and acoustic harps, and percussion with a smattering of live electronics. These sounds, along with the sympathetic personalities of the performers, create great drama and moment in the music. The three made these recordings in California in 2012; might be interesting to know how the session came about. Centazzo, though Italian born, has made America his home now, but you should look into his back catalogue for gems of improv and free jazz collaborations, and start collecting releases from his Ictus label of the 1970s, a tribute in intent and name to the Incus label in the UK. Speaking of Incus, I have heard LeBaron on the Epiphany double LP from 1982, a tremendous document of the Company week from that year, but her history goes back even further. Amazingly, she even plays on that madcap oddity featuring Fred Lane, the Raudelunas ‘Pataphysical Revue from 1975. From 16 June 2017; many thanks to Andrew for sending this. I just discovered this review — many thanks for listening and for your kind words, Ed and Sound Projector!